During Chinese Lunar New Year, families travel long distances in order to celebrate together. They eat special foods which are not only delicious, but also symbolize important values, such as long life and prosperity. A particular theme of many dishes is the symbolism of coming together and staying together, demonstrated with dishes such as lions head meat balls, dumplings, and food made using glutinous rice. A Confucian value often cited, even today, is the ideal concept of family life: four generations living together under one roof. This concept represents the family coming together, experiencing harmony and happiness, longevity, and the continuity and success of a large family supporting each other. A concept used in brush painting composition is also referred to as “four generations under one roof”. In the context of painting, it suggests that a harmonious, balanced, and aesthetically pleasing painting will have 4 variations displayed: four different sizes and forms of rocks in a landscape; four different sizes and types of trees; four tonalities of sumi ink from black to grays to silver; four different degrees of wet ink to dry ink; four views of a flower including front, back, side, top; birds or animals facing in four differing directions; four sizes of leaves; and so forth. However, this does not mean that each object exists independently on the page. Just as a family enjoys facing each other around a table together, sharing and passing the dishes, talking and gossiping and getting into each other’s business, so do the varied objects in a painting need to relate to each other. They need to talk to each other: each is unique in their identity, yet as members of the same family they are interdependent within the story being told by the painting. Each flows towards the others, communicating with their posture and technique. They are separate parts of a unified and balanced whole. When we consider how to organize four generations, we look for distinctly different ways of presenting the objects. The stones, trees and birds do not line up, evenly spaced, the same height. Instead they lean into each other, perhaps cross each other, different in height and width, and even in age. The flowers placed on the page show different faces, but all derive from the same plant and so they relate to a common central core. Similar objects can be grouped in clusters; there can be a cluster of three, another cluster of two or five, and one alone. The spacing between the clusters varies as well. These related differences produce an aesthetic tension, but at the same time a harmonious balance. Brush painting is an organic and dynamic entity, created with pre-determined intent by the human hand and the human mind. Harmony, balance, and energy are conveyed by following the rule of four independent yet interacting generations under one roof. One of the qualities we look for in traditional art is cultural authenticity. By cultural authenticity, we mean that the traditional art object or performance faithfully represents the history, values, techniques, symbols, materials and forms of the culture within which this art has developed. When we believe that art objects or performances incorporate minimal influences from other cultures, we describe these as being genuine, as opposed to being derivative or copied or diluted. We seek out these “real” art experiences; our reward is the opportunity to dwell in other cultures and other times. However, an honest appraisal of any art work created today will make it clear that all contemporary artists, even those working in traditional formats, are swayed by effects from all over the world. We are members of a global community flooded by global communication technology that transforms us in myriad, often unrealized, ways. There isn’t a corner of the earth, no matter how remote, that has not experienced contact with the rest of the world. Cultural syncretism in art has always been with us, but the current breadth and speed of adaptation is unusual in human history. From the moment 10,000 or so years ago when a trader in Village A carried his community’s worked-leather goods to Village B on the other side of the mountain to exchange for their decorated pottery which he brought back to his own Village A, we have been having an impact on each other. We have shared forms, techniques, colors, symbols, sounds, images, usages, materials, cultural values, etc. from village to village, district to district, empire to empire, creating ever-larger cultural spheres of influence as the world grew ever smaller and we learned more and more about each other. Authentic, as in absolutely pure, has been totally lost to us for hundreds if not thousands of years. In the global marketplace, claims of authenticity have become a marketing ploy. Today we are a single cultural sphere, and there is no way of filtering out the weight of other cultures on our art-making. Today, all art is composed of a fusion of cultures. All art is cultural fusion art. As a Westerner trying to learn traditional Japanese sumi-ink brush painting and traditional Chinese landscape brush painting, I have always striven to learn the techniques of handling the brush and the ink, the rules of composition, the meanings of the subject matter, the styles of famous painters through history, the cultural mind-set of the art form -- all in an attempt to produce work that is faithful to its origins. Many people have commented that they experience my work as truthful and genuine -- I think what they mean is that I have captured and conveyed the mood and feeling of traditional sumi-ink brush painting. Still, I have come to appreciate how far from my reach the goal of absolute authenticity remains. I did not pick up a traditional brush until I was in my 20s; I did not grow up surrounded by traditional Asian images and composition; I did not absorb, beginning in childhood, the mind-set of traditional Asian art as part of my personal world-view. At first I was disheartened to realize how far I was from my goal of cultural credibility in my work. Then I realized that art always has been cultural syncretic art, and today this is truer than ever before. Rather than expunge my Western art qualities, I decided to embrace my differences. Now instead of erasing my unique vision, I express it by blending my Western persona with the skills, materials and mind-set of traditional ink-brush painting. My art is strongest and most complete when I fuse both cultures -- Western and East Asian. While I continue to learn as much as I can about the traditional forms and skills which are the basis of East Asian brush painting, I am also exploring new applications of these mixed with Western imagery, informed by Western values and taste. I am consciously and happily creating my own version of cultural fusion art. Every material and immaterial expression of a culture embodies and communicates the values of that culture. We can begin to understand and appreciate Chinese brush painting - an important part of classical Chinese material culture - by examining the ways in which it incorporates the values found within Taoism and Confucianism. Brush painting fuses these two philosophies, harmonizing and reconciling them. Brush painting is at once bound by rules and also requires freedom and imagination; it captures the naturalistic world through expressing an idealistic world-view; it is firmly rooted in tradition yet must be original to each artist. Taoism contributed to the painters’ world view by emphasizing that there is a spirit, a moving power which is part of all objects and gives them their identity. This animating energy is called “ch’I” or “qi” - the aliveness or life breath that is in everything. A brush painting must manifest this spirit. For example, to a Westerner, a rock is inanimate and inert; to the Chinese it is a living thing. The manual of painting called The Mustard Seed Garden, published around 1700, describes how to paint rocks by saying that one would never paint a rock without ch’I. Without the vivifying spirit of ch’I the rock would be dead, dry and bare. Painting rocks with ch’I must be sought beyond the material and the tangible. The form of the rock must be clear in the painter’s heart and mind, and thus its expression lies within the artist. Classical Chinese brush painting relies on the painter’s mind to make manifest in material form the ultimate creative principle in the universe. By doing this, both painter and viewer are connected to this living force. Confucianism, on the other hand, was concerned with the here-and-now; it presented the basic principles which guided social order. Only through conformity to these principles, moderation, and inner strength, could social and personal chaos be avoided. The Confucian ideal was cultivation of the higher self, resulting in the natural elegance of a learned and disciplined scholar who avoided commonness and vulgarity. The Confucian-trained painter was well-read and well-traveled, able to gain the wisdom of the ancients through extensive learning and diligently following the tried and true rules. Painters were scholars, part of the state-supported intellectual aristocracy which embodied the best of Chinese civilization. At the same time they were enjoined to be humble, free from craving for personal fame. They said much with very little, seemingly effortless in exercising their art. They were “ama-teurs”, painting for love of the activity and what it meant, not for commerce. Within themselves, the scholar artist reconciled contradictory values: they were celebrated for being spontaneous and eccentric, expressing a personal character, but they had to do so without straying outside the traditional bounds of the cultivated gentleman. They were required to find their own style, but only after exploring all the styles which had come before. The scholar-painter represented a harmonizing of freedom and tradition, furthering the stability of the state without letting it become static. Scholars learned about and furthered the Confucian virtues by studying the paintings of those who had come before them and producing their own contemporary versions which would, in turn, be studied by those who came after them. These comments were inspired by the basic text of Chinese brush painting available to us today, The Mustard Seed Garden (1700), and by Principles of Chinese Painting by George Rowley (1974). The Japanese approach to brush painting is transformative, involving the following of a philosophical and spiritual path. By following this path, the practitioner commits to self-cultivation, to achieving a higher and better self. Learning brush painting is more than engaging in a hobby; it is more than simply trying something out, picking it up and dropping it again when inconvenient. Inspired by Shinto and Buddhism, brush painting is one of the traditional Japanese ways in which a person can learn a more inclusive, overarching understanding of the wholeness of all life. Through following fu-do, the practitioner comes to recognize the union of mind and body, a united sense of self and the outside world, a communion between sentient and non-sentient beings. To achieve this learning requires a rigorous, dedicated, life-long commitment, called “shugyo”. The study of and immersion in this and any other traditional Japanese art-form provides the experience of pursuing the most noble of aspirations. It is more than just learning the skills, the movements, the craft aspects. While practitioners strive to be the best of the best in what they are studying, that goal is less important than the process of following the way. Following the path of the brush with shugyo presents the individual with the possibility of releasing the “kami” nature, the divine potential which is in each of us. ...is made from burning certain kinds of wood or oil to produce soot. Originally the soot was scraped off the sides of kilns which were used for making ceramics. Today the soot is collected from glass or ceramic dishes. Soot is compressed with animal glue to create an ink stick which is then aged. Burning different woods or oils produces different black colors with tinges of brown, blue or pure black. The goal of painting with sumi ink is to create paintings which, although in black and white, appear to be in color. The ink, mixed with varying amounts of water, produce lines and forms which vary from deepest black to silvery gray. Knowing how to control the “color” of the ink is crucial for producing a satisfying painting. These are usually made of natural stone but can also be made of ceramic. The stone must be porous, with a smooth surface for grinding. Some natural stones, such as "duan" stone, make outstanding and very valuable ink-stones that produce excellent ink when the ink-stick is ground with water on the flat surface of the ink stone. Stones are often valued for the type of rare stone used, and/or the carving which adorns them. Usually a stone used to prepare ink for calligraphy has a deep well, while the well on stones used for painting is much shallower. Calligraphy uses more ink than painting. Grinding the ink is a meditative process, taking anywhere from 5 minutes to 30 minutes. The process of grinding the ink stick in water against the ink-stone warms up the muscles of the hand and arm so it will be ready for the physical act of painting with the whole body. Since painting requires absolute attention, the process of grinding also allows the painter to begin to separate from the everyday world, focusing the mind, relaxing and contemplating what is to be painted that day. Once the ink-stick has been ground with water on the stone to create a dense black viscous liquid, it is applied to the paper with a brush. Both the sumi-ink painting brush and the calligraphy brush consist of a long, usually bamboo, handle and different kinds of animal hair. The hair is arranged in a circle extending from the end of the handle, and comes to a point. With painting brushes, often there are 2 or 3 different kinds of hair attached concentrically and tapered, with the stiffest hair creating the point in the center. Made of all-natural hair from different kinds of animals, this brush is remarkably resilient and expressive, serving as a direct extension of the painter's arm and hand. Some painters use different sized brushes – different in thickness and in length of bristles - to achieve different types of lines. Other painters become comfortable with their favorite brush and use it much of the time, varying the line by varying the amount of water and ink used. Different kinds of brushes with different types and lengths of animal hair are used for different subjects. Flowers want a slightly softer brush, bamboo wants a springier brush, landscape wants a stiffer but highly expressive brush, washes want longer bristles, and so on. But always, the character of the line on the paper reveals the character of the painter and the quality of their state of mind. Rice paper, sometimes also called "washi"
This is paper made from the inner parts of the rice plant, hemp, bamboo, or most commonly, the bark of the mulberry tree. It is highly fibrous and usually lightly sized on one side using alum. It is very thin, yet very strong. When sumi-ink is applied, the fibers grab the ink so that each stroke is permanent and cannot be erased or covered over. There are different thicknesses and fibrousness of paper which interact with the ink and the water in different ways to produce varying effects. Fine line painting prefers sized paper; landscape painting with its washes prefers less sized paper made from longer fibers that can hold more water without breaking down. Because the paper is highly fibrous and reactive, once the ink is laid down in a stroke, it cannot be erased or painted over. The less experienced painter is often highly tentative, worrying about making mistakes. The more experienced and more highly trained painter has confidence, moving the loaded brush along the paper with energy. The partnership between painter and paper mediated by ink-loaded brush makes for a lively and energized painting which doesn’t have to be perfect in order to be deeply expressive and satisfying. Each of these items, plus many more, are part of the accoutrements of the scholar and have been collected over centuries to make up the scholar’s studio. What is a sumi-e? What is a brush painting? “Sumi” is the Japanese word for a particular kind of black ink. The ink is actually made by collecting soot from burning certain types of wood or oil, mixing the soot with natural glue, and compressing it into a stick. The stick is ground in water against a hard stone surface, creating a rich black ink. “E” is the Japanese word for “painting”. A sumi-e is thus a painting made with soot-based, ground black ink. In Chinese this type of painting is called “guohua” - national or native painting - as opposed to Western style painting. Today, the word “sumi-e” or “sumi-ink brush painting” refers to paintings using soot-based ink, applied onto fibrous paper using a flexible pointed animal-hair brush. Sumi-ink brush painting is more than ink-brush-paper. It is painting which uses techniques developed over many centuries in China, Japan, Korea, parts of Vietnam, and parts of Malaysia. These techniques take many years and much inner discipline to master. They involve using ink tones ranging from deep black to barely visible silvery gray. The tones are produced by mixing the intense black ink with different amounts of water, producing strokes from wet to dry and thin to thick, plus producing washes. The techniques also include mastering a number of specific types of strokes, some with quite imaginative names like “hemp stroke” or “axe cut stroke”. The ability to manage the long-haired pointed brush is key. The brush is flexible and expressive and capable of producing lines and forms which no Western-style brush can approximate, but it has a mind of its own and taming it takes a lifetime. Then there are the compositional elements which are to be mastered. Usually Western ideas of depth or vanishing-point perspective are not adhered to; shading to produce depth is also not particularly used. Instead, Asian notions of nature and humans and their relationship infuse the composition. 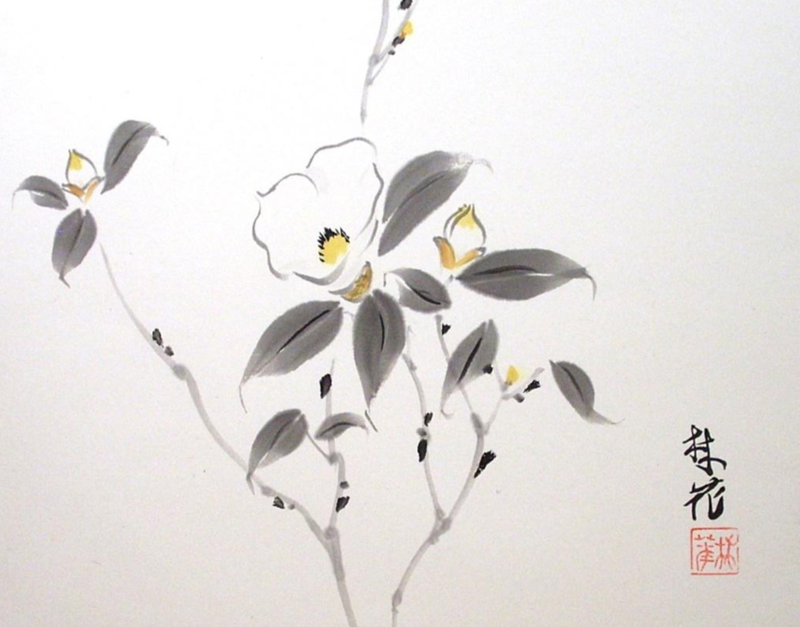 Because brush-painting derives from Chinese calligraphy, the quality of the stroke is of the greatest importance. The quality of the painter’s character is visible in the quality of the stroke. The idea is to capture and portray the essence of the thing being painted, not in a realistic way but in a way which is alive and genuine. Capturing “chi” or “ki” is very important: a painting must be alive, filled with and expressing the energy of the real world. Thus, becoming a sumi-ink brush painter involves being immersed in philosophy, religion, history of art and culture, as well as almost endless technical challenges. It requires a depth of patience and personal commitment to learning the disciplined way of the brush, resulting in a refinement of spirit, and harmony with nature. When this process is realized, the result is a sumi-ink brush painting. Sumi-ink brush painting captures the essence of its subject. For example, it is a good thing to paint a grasshopper that looks like a grasshopper; however, realism is unnecessary if you want a painting that conveys grasshopper-ness. To convey the essence of object and experience, the painter must capture the significant physical and experiential qualities. The grasshopper has strong back legs that are long and muscled; these enable it to jump long distances. The grasshopper has searchingly inquisitive feelers that reach out and up, quivering for information about the world. If the painting has these two pieces of information, it has captured grasshopper-ness. It "works"! Brush painting doesn't seek to imitate or master nature. A brush painting is the vehicle by which the painter and the viewer seek harmony with nature. To achieve a satisfying aesthetic and emotional result, the brush painter commits to reconciling freedom, structure and skill. Freedom without structure and technique is meaningless and chaotic; structure and skill without freedom is constricting and lifeless. The proper balance of all three is the key to a successful painting. Sumi ink brush painting requires mastery of technique and rules of composition. If a painter doesn't know all the many complex and subtle ways to use the ink, brush, water and paper, they cannot effectively paint. These techniques take a lifetime to master. There are no short-cuts. On the other hand, technique is nothing without "chi”: spirit and energy. The expression of a truthful spirit takes no time to master. It is immediately possible and available to anyone, given the right circumstances. A successful painter is one who combines both technique and spirit. Successful sumi painting communicates the heart of a place or object. It consists of a confidently expressive line, the range of possibilities inherent in the brush, paper, ink and water, and follows the rules of Asian-art composition. When viewing a sumi ink painting, if it does not elicit a smile of pleasure, a nod of recognition, a sigh of contentment, walk away because you are wasting your time. All art is truth. Sumi-e is especially this way because it is so simple and yet contains within its contours the whole world of experience. Above all, avoid the decorative, the facile, the static image. Life is too short to punish yourself by looking at work that is less than it could be. Sumi ink painting might look simple; that is its deceptive magic. Spend time with a fine sumi-e. Allow it to draw you in and you will find yourself amply rewarded.